and finally, one of its main reasons for being written was to counter Marcion’s “heresy”. That last detail (re Marcion) is not explicitly included in the “top ten” list below. It comes from the supporting essays in the same Introduction chapter. I will expand on some of these in future posts. The author did not simply stitch together a grab-bag of various collected sources and had no interest in preserving or conveying genuinely historical information. He was an accomplished storyteller (the editors add “theologian” as an alternative to “storyteller” — they write “storyteller/theologian” — but I wonder if that would be offensive to theologians today who insist that they be respected as genuine historians, not storytellers! 😉 ) who was in complete control of his material and could turn it to whatever ideological message he wished to convey. Among the implications of this new date is that we can no longer think of the author as a companion of Paul and the work itself cannot be considered reliable testimony of the mid first century. “Groundbreaking studies by William O. Walker and others” (some of which have been referenced in posts here) have demonstrated the likelihood that the author of Acts did indeed know of the letters and theology of Paul even though they are not made explicit (sometimes even contradicted) in Acts. This is even more likely given the second century date since the letter collection of Paul was becoming known from around 100 CE. primarily based on the ‘remarkable’ correlation of the story of Acts with the letters of Paul. This notion has been girded by assumption that the author was a companion of Paul and participated in some of the narrative’s events. Once we move Acts to the second century many problems and questions are resolved. “Background material or literary models” were found by the author in Josephus, Homer, Vergil, the Septuagint (LXX). These were not sources of the story itself, however. I look forward to the day when more scholars (for similar methodological reasons) will conclude that Christianity itself did not originate with a handful of followers of Jesus being persuaded that their “Gospel/historical Jesus” had been resurrected. Can we hope that some will take the studies of the Acts Seminar on this point and continue to follow through and apply the methodology to that next question? I have not found such conclusions “hard” to reach, myself. But then I have not invested my career in this business. To my way of thinking, if details in a narrative have an obvious rhetorical rationale and are nowhere else attested, then the simplest conclusion is that the details are entirely literary. That does not mean they may not also be historical at some point, but it does mean we have no valid rationale for assuming their historicity — until further evidence turns up. Is this a slippery slope? Where will it end? What will we do those symbolic names like those of the disciples themselves, and other people and places in the gospels, not to mention (according to one classicist at least) the symbolic character of the very name of Jesus himself. It has long been understood by many that Acts is composed to promote certain ideological agendas. I find statements like this somewhat dismaying. One of the reasons for some of the conflict that exists between a few scholars and sceptical lay folk on the internet is that among the lay readers are intelligent and reasonably well educated people who are asking why scholars don’t apply certain principles, findings and methods consistently. There seems to be so much “ad hocery” in the literature. Methodological rigour is too rarely applied consistently and consistency of argument is rare. There are always the convenient exceptions and departures that preserve the basic constructs of the overall (Acts-Eusebian) model of Christian origins. Ehrman has recently complained that critics seem to have endless time and energy to ague point after point after point after point. That to me sounds like he is tired of being asked to defend arguments against even lay readers who can identify the inconsistencies and convenient exceptions. Rather than have the courage to face up to their methodological inconsistencies too many seem to resort to appeals to their “extensive training and credentials” and to the lack thereof of those who pester them with inconvenient questions. 10. Acts must be presumed nonhistorical unless proven otherwise. This is a reversal of the approach of many scholars in the past: that Acts can be assumed historical unless proven otherwise. This is the cumulative result of the above findings. Surely such a conclusion ought to suggest something more. Surely it highlights that it is unsafe to simply assume a document that looks prima facie something like history can be assumed to be basically historical unless proven otherwise. That’s nonsense for so many reasons that I have elaborated upon repeatedly in the past. Historicity requires an examination of provenance, genre, and independent supporting testimony. I know of no exceptions in any non-biblical field of historical studies and I do not believe Biblical studies has a valid claim to being exceptional. So is Acts useless as an historical source? 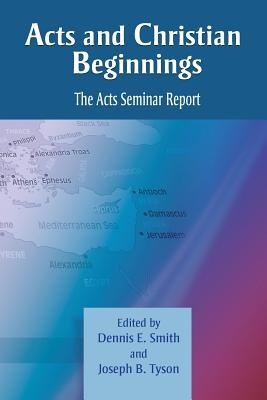 If Acts is useless as a source of historical information of first-century Christianity it is not useless as an historical source per se, as the editors of the Report point out. Not at all. Once we can ascertain with some more certainty something of the provenance and genre of Acts we can then appreciate how it can most validly assist historians. The editors rightly point out, in addition, that interpreting Acts as produced in the second century is not the same as interpreting it as it was read in the second century. And they are explicitly addressing their scholarly peers who sometimes are said to confuse these two. Posted on 2013-11-22 04:54:06 GMT+0000 by Neil Godfrey. This entry was posted in Biblical Studies and tagged Luke-Acts, Smith: Acts Christian Beginnings. Bookmark the permalink. This is devastating news for the Ehrmans and Hurtados of the academy, people who frequently quote Acts as a historical witness as credulously as they quote the gospels. Conservatives will ignore the report, or attack it, just as they did the Jesus Seminar from the same quarter. I think Helms makes a good case in ‘Who Wrote the Gospels?’ that the author of Luke/Acts could have been a woman. I’ve never heard of this idea anywhere else, and I always keep this possibility in the back of my mind. But what about the We Document? It kind of looks like a different writing that was stitched to the end of Acts, more than simply because it says “we” and “us.” It at least stands out as being, for some reason (and I’ve know you’ve written about this in other posts), different from the rest of Acts. To these things, Eisenman argues that Acts may have also been aware of the Damascus Document. There are at least important themes that thread through Acts which I’ve pointed out in previous comments here have parallels in the Damascus Document, like the importance of “the Name,” and the Holy Spirit being revealed by the Messiah. I can’t flesh this out any more here now, but I feel as comfortable with this idea as I do with the idea that Luke knew Josephus. Again, none of this stuff is intended to defend the veracity of Acts. These are just some of the things that come to mind when I think of Acts. Luke’s preface can well be understood as a reference to the existence of community officers with responsibilities in connection with the logos as read and taught in the community’s schooling programme. I am surprised that Bauckham appears to have overlooked Collins’ very cogent argument — I believe it was published in a prominent Scottish theological journal so no excuses — in his forthcoming book. Of course Bauckham’s thesis needs the conservative translation of that preface as critical evidence to remain viable. The “we passages” are not confined to the last section of Luke. There are in fact four of them (iirc) in Acts. The final part of Acts is, in my view, no more different from the rest of Acts than are the last parts of most Hellenistic novels (and epics) in popular and learned literature of the day. Episodic beginnings and an extended in-depth drama at the end was a popular format ever since Homer’s Odyssey. Another view of the “we passages” (okay, it’s my idiosyncratic view) is that they serve to bring in the Roman readership to identify vicariously with each scene that presents a another move towards Rome (or Roman colony on the way) — given that Acts is a type of Aeneid substitute for the church, largely arguing for the migration and relocation of God’s HQ from Jerusalem to Rome. The Acts Seminar Report does have a section discussing women, and concludes that the treatment of women is not as liberal as sometimes claimed. Will post more on these. I suppose “incorporated into the last half of Acts” would have been more accurate. I tend to regard anything after ch. 15 as “the end,” so I wasn’t thinking that “the end” could be seen to mean the last section. I remember that post you link to, and I will have another look at it when I get time. I have a webpage I wrote some 15 years ago demonstrating that “Luke” was a woman, and a Roman citizen living in Philippi, a Roman colony in Macedonia. Your conclusion from the evidence you provide on that website that the author was a woman strikes me as very limited. The same evidence informs us of much more about the author. Yes, she was a woman, but also a lesbian, with a foot-fetish, and an incestuous passion for her mother, divorced and remarried (no doubt to a another woman), . . . . If it was written so late, Acts would go against the “too good to be true” statements that after the resurrection/ascension the eyewitnesses of Jesus went in all the known world to make convert and start Christianity. That idea was was prevalent during the second century. Instead in Acts, others than Jesus’ disciples are starting Christianity all over. c) Justin Martyr (150-160), in his 1Apology XLV “His apostles, going forth from Jerusalem, preached everywhere”. Maybe that’s why it was written so late. The Acts seminar suggests the early decades of the Second Century; on the established dating of the extant earliest manuscripts in whole, part or fragment, I posit a date of writing in the neighborhood of 165-180 CE. On this blog entry, I put forward evidence for Acts being written towards the end of the first century. Bernard, you are back to your old tricks of simply using posts here as springboards to say, “No, that’s wrong, here’s how it really is.” That’s not engaging in argument. It’s mere advocacy. It’s arguing like some theologians. Please refresh your memory of our comment guidelines. I agree that Jesus eyewitnesses were not the ones who started Christianity. I agree Christianity did not start from the belief that Jesus resurrected, but from the wishful thinking that the would be King (for some activist Jews) was saved in heaven and ready to come back when the Kingdom of God would begin. I also think Jesus’ eyewitnesses and Jesus’ family members never became Christians and did not “see” Jesus in heaven. And they did not start the Church of Jerusalem: Others did. Also Christianity as we know it did not begin in Jerusalem, but only a mild version of proto-Christianity did. True Christianity started among Diaspora Jews, in city like Antioch. And then Gentile Christianity was developed on the fly by Paul, with Apollos of Alexandria providing many key elements (I take Apollos has the author of ‘Hebrews’). All of that is explained on my website. I can’t tell from these quotes that any of the writers in this book or participants in this seminar conclude that “Jerusalem was not the birthplace of Christianity.” Does this represent your own interpretation, or is it their claim? Jerusalem was not the birthplace of Christianity, contrary to the story Acts tells in chapters 1-7. Yet this account is historically problematic on many counts. The early audiences and the author of Acts had no firsthand experience of the physical setting of Jerusalem. Once the city was completely destroyed in 70 CE, the city was in ruins and mostly uninhabited during the decades in which Acts was written and first read. . . . The author and audiences of Acts did not know the city as an active place of veneration; rather, Jerusalem was a site of mythic imagination that was claimed and envisioned by authors who used this (ruined) site as a powerful narrative setting. Luke’s entire Jerusalem origins narrative, from the resurrection appearances to the command to stay in Jerusalem to the distinctive events in Jerusalem, is built on a Lukan fiction, constructed to lay a foundation for the apologetic story he will tell in the rest of Acts. Luke’s narrative is said to contradict all other stories relating to origins. It contradicts the evidence that the earliest evidence points to Christianity beginning in diversity, not unity. Thanks, Neil, this is a very helpful clarification. Do the Fellows make anything in particular about the odd behavior of the Roman authorities in Acts who completely ignore Jesus’s known followers as they openly enlist thousands of new recruits just mere weeks after their leader’s execution? IIRC, Carrier will focus on those discrepancies in his upcoming book. They are discussed but not within that question-frame. Only point out that the Jewish authorities opposed them as they opposed Jesus. I didn’t know anyone accepted those figures as plausible (except “true believers” but I am not interested in arguments of those who believe in angels and spirits etc). Aren’t they likely from the Old Testament accounts of deaths upon those who rebelled? I disagree (that means I am in agreement with the seminar), they went back to Galilee. I agree. The first proto-Christianity church started in Jerusalem by activist/hellenistic Jews and after the Greek dispersion propagated that proto-Christianity, in cities like Antioch. Bernard, please try to understand. “I disagree” is not an argument. It is a grammatically refined form of trolling. Neil, I would gladly explain my position if I did not feel under threat of censorship. I got cancelled messages on your blog already. I do not want to spend much time and then be cut off. Do you want me to explain my position, on agreement and disagreement? Jesus could not have been wrong in his prophecies! And these authors did not think the disciples (and followers) stayed together in Jerusalem! where I follow through with the ending & gLuke and the beginning of Acts, the inconsistencies and falseties about the two. Baloney, Bernard. You are not censored on the internet. You can post whatever you like. It’s about being “cordially Bernard” — which I presume includes the concepts of “civility” — and that means respecting other people’s spaces for the purposes they desire. If I was censoring you I would have deleted your earlier posts that were crude adverts for readers to dismiss what they read here and to turn to read your page instead. But I chose to keep the links to your site here. So where is the censorship? But when you post mere “I disagree” or “I have the correct view of this on this other site over here” type of stuff then of course you are doing nothing but trolling. If you wish to guarantee your comments appear and stay here on this blog then address the arguments presented in the posts — I mean address them with arguments that show you have thought about what is being presented and can offer reasons for disagreement — not simply “that is wrong, here is how it really is” type stuff. Demonstrate that you can argue your point here, including the reasons and evidence upon which you find points in my post at fault, and you will be cordially welcome. But you are not welcome on the basis of your comments up till now, and meanwhile I have bent over backwards to bend my own comment rules to ensure that readers do have links to your own site! It is brilliant spamming to complain about censorship if copious website references don’t get through. One reason I find this particularly satisfying is that it does add some respectability to the posts I have taken the trouble to share on this blog while various scholars have cavalierly ridiculed the posts as some sort of “conspiratorial” or “hyper-sceptical” and “unscholarly” nonsense. What chagrined me was that they chose a librarian from among their ranks to classify the various blogs. Just goes to show how ideological even librarianship can be. I once knew a librarian in charge of a small library who classified the Bible in the Spurious Knowledge section so it sat alongside books on demonology, occult, divination, etc . . .
And controversial, too. Librarians often get in trouble with religious fundamentalists especially here in small towns and exurban suburbs (a redundancy to the point of an oxymoron) in the US over books the Librarian stacks, that the fundies discover they don’t like after years or even decades of it being available to the community. I would love to see a librarian put a bible in the spurious knowledge section or even the adult fiction section here… but I know it’ll never happen in “Christian America” without the librarian being reprimanded, disciplined or even terminated! I would like to learn more about number 5.